If you participated in the 2015 California QSO Party, and submitted your log, you can now print a customized 50th Anniversary Certificate of Achievement. Both Personal and Team Certificates can be printed, depending on your class of operation. Follow the guidelines in the chart. Download the PDF, then print and frame the certificate for your collection, post it to your Facebook page, your website, your blog, or ?? 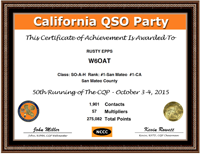 We hope you enjoy your Certificate and thank you once again for participating in the 2015 California QSO Party!